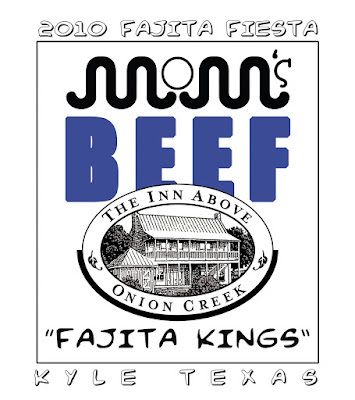 On Saturday April 3rd, executive chef Marcos Galvan and his sous chef Ryan Castille will be competing in the 2010 Kyle Fajita Fiesta & BBQ Cook-off. Marcos and Ryan will be entering the Beef Fajita division and they have a secret weapon in their arsenal, MOM's Beef. MOM's beef is raised down the road by Sharon Michaelis and it's amazing! We like to think it's the Kobe Beef of the texas hill country. The cows are mainly feed grass that has not been treated with herbicides, along with a daily serving of grain. Many times you can find the cows roaming around the Inn Above Onion Creek as Sharon brings the cows down the road to us so they can graze on our native grasses. If you're going to be visiting the Inn Above Onion Creek this weekend be sure and stop by the Fajita Fiesta to show your support for MOM's Beef and the "Fajita Kings", plus there will be free samples of all the great food. Located at the historic City Square Park in downtown Kyle, Texas.